Monday & Wednesday: 7 a.m.–5:30 p.m.
Tuesday & Thursday: 8 a.m.–5 p.m.
Brown spots (often called age spots or liver spots) and other small, brown skin lesions on your face and hands can add years to your appearance. At The Spa at MidAmerica Plastic Surgery, we customize nonsurgical procedures with minimal downtime to erase these unwanted imperfections. Our Maryville medical spa treatments for brown spots and hyperpigmentation include microdermabrasion, chemical peels, and laser removal. Patients who visit our med spa east of St. Louis consult first with Dr. Ryan Diederich who, along with one of our licensed estheticians or registered nurses, can determine the best treatment for their skin concerns. It’s important to ensure that any discolored marks aren’t a form of skin cancer. Dr. Diederich is a Southern Illinois native realizing his dream of giving back to the community. He helps patients feel and look their best with his surgical skills and compassionate care. Treatments to lighten age spots and other hyperpigmentation vary in the number of procedures needed, how long they take, and the post-treatment instructions to follow. Learn more about each of the treatments by visiting the corresponding pages. Chemical peels differ in strength, ranging from light to moderate to deep. We customize peels to best address the severity of each patient’s hyperpigmentation or brown spots. Moderate peels are less aggressive than deep peels, but may require multiple treatments to get the desired results. A deep phenol peel, while producing results after only a single treatment, will require more downtime. Our state-of-the-art laser targets the spot or spots that bother you. Melanin–the pigment that gives these spots their color–absorbs the laser energy, so the heat breaks down the pigment while leaving surrounding tissue unharmed. We carefully monitor the laser treatment to ensure its safety. After the treatment, the pigmented spots gradually scab over and then fall off the skin. If you’d like to learn more about your options for treating pigmentation irregularities, request a consultation with Dr. Diederich using our simple online form. You can also call our office at (618) 288-7855 to schedule an appointment. © 2019 MidAmerica Plastic Surgery: Ryan Diederich, MD. All rights reserved. 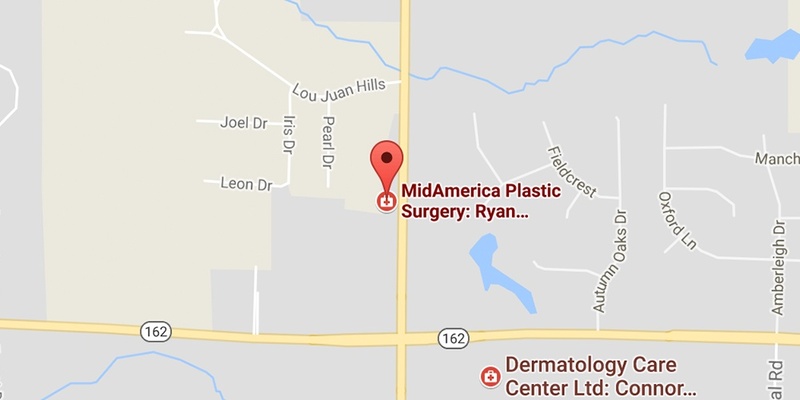 Dr. Ryan Diederich is a highly trained and experienced plastic surgeon who specializes in cosmetic and reconstructive plastic surgery in Glen Carbon, IL, at MidAmerica Plastic Surgery. Dr. Diederich is certified by The American Board of Plastic Surgery and is a member of The American Society of Plastic Surgeons, The American Association for Hand Surgery, and the Illinois State Medical Society. Dr. Diederich specializes in cosmetic breast surgery, including breast augmentation, breast reduction, and breast lift procedures. He is also known for mommy makeover procedures, which typically include tummy tuck and liposuction. MidAmerica Plastic Surgery serves patients east of St. Louis, including residents of Maryville, Mt. Vernon, Marion, Springfield, and throughout Southern Illinois.